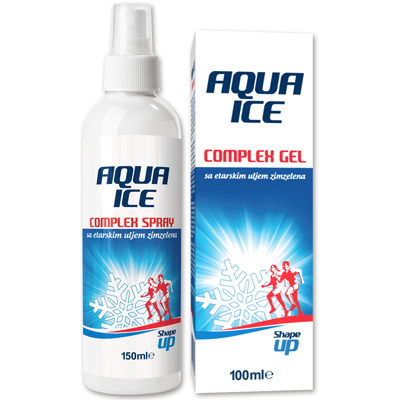 Thanks to its ingredients and rich formulation of active components, Aqua Ice Complex gel and spray help soothe problems caused by contusions, sprains and sports injuries. They achieve an optimal effect with completely safe use. They have a beneficial effect on stiffness and tension in muscles, joints and bones. Immediately upon use, they give a long-lasting cooling feeling, and problems are significantly soothed. Use of these preparations achieves an anti-inflammatory effect on the application area. Essential oil of Gaultheria Procumbens contains 99% of methyl salicylate, natural aspirin, which is why it is traditionally used for soothing rheumatic problems, relaxation of tense muscles and painful joints. With synergic action with the white willow bark extract, which also contains methyl salicylate, it manifests anti-inflammatory and analgesic properties. In combination with essential oils of eucalyptus, pine and clove it facilitates blood circulation and additionally contributes with a pleasant cooling feeling on the application area and soothing problems. Arnica flower extract improves the blood supply of tissue, alleviates swellings and bruises caused by contusions, sprains and sports injuries, and soothes the skin, which makes it an irreplaceable ingredient of this gel. Menthol evaporates from the surface of the skin and has a mild antiseptic effect. It affects temperature receptors and causes a pleasant cooling effect on the application area, which leads to soothing of rheumatic problems. Aqua ice Complex Spray achieves double efficiency by immediately causing a feeling of cooling, and shortly after a pleasant warm feeling. Apply the Aqua Ice Complex gel by massaging it with mild circular motions into the painful area (for 2-3 minutes) several times a day, no more than 4 times a day. After application, there is a pleasant cooling feeling which originates from effective active ingredients. The gel has a pleasant aroma, it is easily spread, does not stick and does not stain clothes. Apply Aqua Ice Complex Spray by spraying onto a painful area and massaging gently, several times a day, no more than 4 times a day.